In Lucid #3 we get a good dose of history, who the bad guys are and what they want. It’s a lot to jam into 24 pages, but it works really well. I hate to say this four issue limited series is an example of packing a lot into a few pages, but writer Michael McMillian pulls it off without issues. LUCID barrels toward an explosive climax as Agent Dee is pulled deeper into a dark conspiracy fraught with bold, unbridled evil! After a dangerous Magical Artifact created by Matthew’s infamous ancestor disappears from the archives of The School of Black, Matthew travels to London to team up with England’s Combat Mage, the beautiful and enchanting Wren, to hunt it down before all Hell breaks loose. 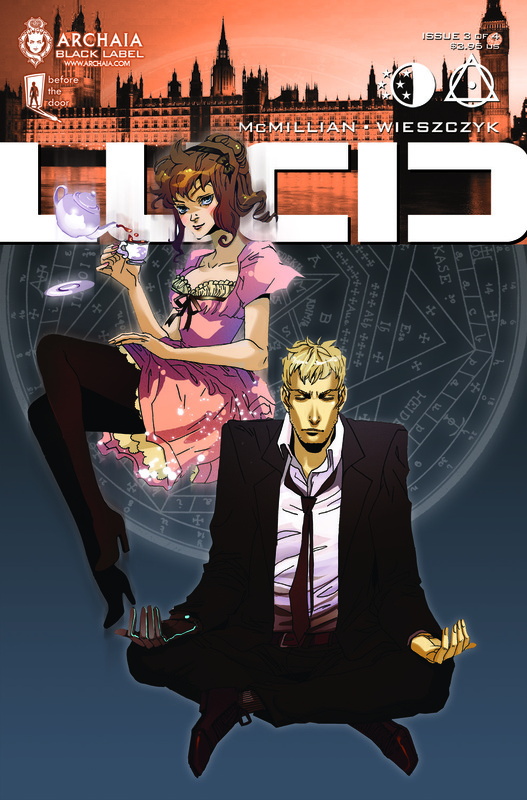 LUCID is Archaia’s first title published in association with Zachary Quinto (“Heroes,” “Star Trek”) and his company, Before the Door. There’s a lot here and the weaving of modern day with magic works quite well. There’s something I really like about this series as well as this issue. There’s action, evil, just tons to have fun with. This limited series is only four issues, but I’m hoping we get a second volume that lasts for more. I’d like to see what McMillian could do with more. Archaia provided Graphic Policy with an advance copy of this issue for FREE for review.